The annual Information and Technology in Aged Care (ITAC) conference was held on 21-22 November at the Adelaide Convention Centre, exploring the enormous potential and current ways technology and innovation is helping Australia’s ageing population live well. The two day conference, now in its eleventh year and brought together by the Aged Care Industry Information Technology Council (ACIITC) saw roughly 400 people soak up the innovation and technological advances shaping the future of Australia’s aged care sector. With the theme ‘Co-Designing our Digital Future’ delegates were treated to 34 information sessions, delivered by industry experts. CEO of Leading Age Services Australia Sean Rooney opened the conference, highlighting the demand for consumer-centric care and the great potential technology has in providing safe, efficient and quality care to ensure older Australians age well. “Technology will be a great enabler,” he says. Over the two days, experts and guest speakers spoke of innovative design, the myriad of uses and how this can be applied to benefit older Australians within the aged care space, with many touching on the importance of using technology to improve, rather than replace the human delivery of care and support. “Technology is not going to be the sole answer, but it does bring people together,” CEO of Deloitte Centre for the Edge, Peter Williams says. Assistant Secretary to the Department of Health’s Aged Care Access Branch Val Spencer, also announced exciting improvements and developments in the works for the national gateway to aged care services, My Aged Care. “We know we can do better with the process. We know we can make it easier for older Australians and their support networks,” she says. The improvements include a new, streamlined website, a direct referral portal for health professionals, an online self service and a portal for assessors, providers and clients. Platinum sponsor, Leecare Solutions were thrilled to be involved in this year’s conference, showcasing their fresh new look. “We are loving it and we have been celebrating our 21st anniversary, so we used ITAC as an opportunity to rebrand,” Training Consultant and Project Manager at Leecare Solutions, Amanda Jones says. The annual ITAC IT Awards Gala Dinner were also held on Wednesday evening to recognise the innovative products and services delivered by providers and companies across the residential, aged care, retirement living and home and community care sectors. 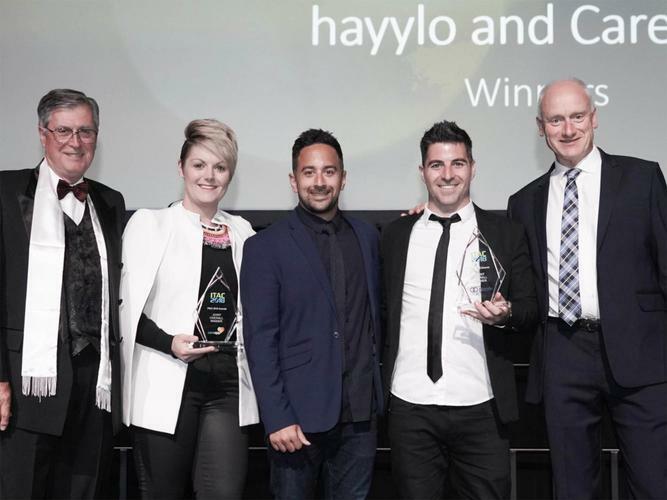 Divided into six categories, with high commendations given alongside category winners, it was two companies, hayylo and CareApp who took out the top gong of overall winner of the IT Awards. “This is amazing and a testimonial of the work going on [in the aged care sector],” co-founder of hayylo Gregory Satur says. “It is an absolute pleasure to be sharing this moment with another start up. Everyone in this room is committed to helping people who are ageing to live well,” Founder of CareApp Allison Nikula says. IRT Group also received an award for the second year running, taking out the ‘Best application of business intelligence to leverage value from big data’ category. “The award is recognition of our work developing cutting edge technology to enhance the daily lives of IRT residents and customers,” IRT Group Executive General Manager - Information and Technology, John Vohradsky says. An extra special accolate was given to Research and Development Director for Global Community Resourcing, Anne Livingstone, who was inducted into the Hall of Fame. Ms Livingstone was recognised as a standout in the industry, for over 35 years’ experience in the community service sector and her efforts in promoting innovative, new and emerging technology in this space. “We’re in an era when we need more innovative and responsible consumer-centric services,” she says. After two days dedicated to discussing smart homes, consumer-centric care, data and assistive technology, ACSA CEO and member of the ACIITC Pat Sparrow closed the conference, highlighting the important role the annual event plays in driving the future of aged care. Ms Sparrow thanked ITAC organisers, the chairs of the ACIITC and all the sponsors for contributing to another successful event, before addressing the conference attendees. “[Thank you] for what you do each and every day. It’s so important in the care that we do provide to older Australians and we need to keep that front and foremost in our minds everyday and whatever we do is to make sure the live of an older person is as good as it can be and technology is clearly an enabler of that.